CityU graduates are always in demand among employers in Hong Kong. CityU’s annual survey found that 95% of its 2017 Bachelor’s degree graduates had secured jobs or started their own businesses or were pursuing further studies in Hong Kong or overseas by the end of 2017. 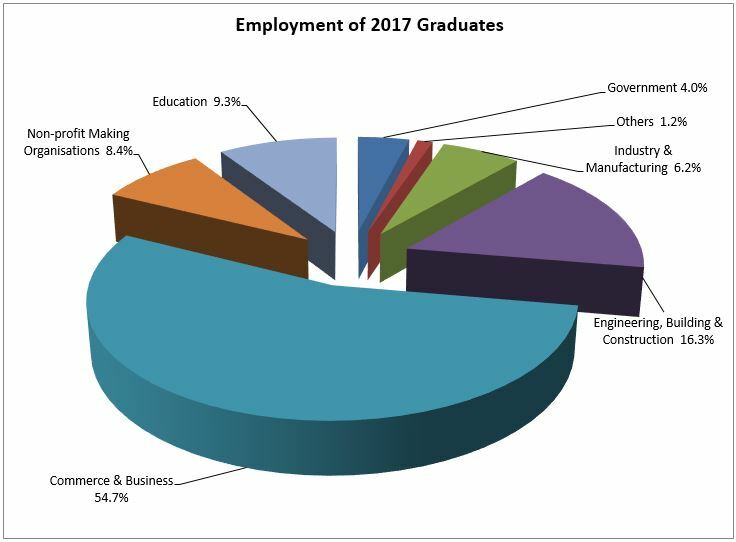 The private sector was the primary employer, absorbing 78.3% of employed Bachelor’s degree graduates, followed by the education sector and non-profit organisations, which collectively employed 17.7% of graduates while the government sector took 4%. CityU graduates are highly commended by employers for their work ethic, interpersonal skills, IT skills and technical knowledge. Feedback from employed graduates reflects the relevance of our programmes in the workplace and for their careers. An increasing number of graduates attribute their success in securing jobs to the experience they gained from the work placements or internships in renowned companies or organisations that formed part of their studies. The majority of students get an early start on their career planning. The Career and Leadership Centre of Student Development Services offers an extensive range of programmes to help students acquire the concepts and skills needed for self-understanding, career planning, job hunting, workplace success and future career development. Students have opportunities to broaden their horizons by joining local, regional and overseas internship programmes. They can also take an active part in organising campus activities through which they can hone their communication and leadership skills.